In this lesson, we will look at converting fractions to decimals. 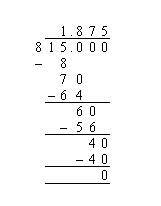 In another lesson, we will look at converting fractions with denominators, that are multiples of 10, into decimals. 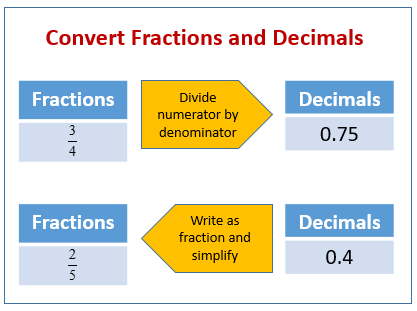 The following diagram gives some examples of converting between fractions and decimals. Scroll down the page for more examples and solutions. How to convert a fraction to a decimal? When we convert a fraction to a decimal, we divide the numerator of the fraction by the denominator. The denominator may not always divide the numerator exactly. In this case, write your answer to the number of decimal places as specified in the question. In this example, the division results in a non-zero remainder. Since we are required to round off to 2 decimal places, we perform the calculation until 3 decimal places and then round off to 2 decimal places. More examples of converting fractions to decimals.